Ric-rac is such a fun, quirky trim that comes in such a variety of colors and sizes, it’s no wonder that it’s still a popular material for many crafters and sewing enthusiasts. 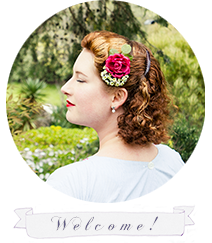 So if you’re are looking for a simple way to add a touch of that vintage~flavored kitsch to your outfit, then this Ric-Rac Rose Jewelry Tutorial is just the thing for you! Step 1: Cut a length of ric-rac, fold it in half and twist the two pieces around each other. Step 2: Roll the rose up and secure it with glue or thread so it doesn’t come unraveled. You can use pins to get the placement of the end right, or just hold it tight. Step 3: Peel the petals back if you like, or use it as a rose bud. Step 1: Cut two 15cm pieces of 1/2cm wide ric rac and roll them into a rose bud. Step 2: Glue your bud to the earring finding. Note: I used bead cups with the post earring threaded through the hole in the middle because the disc at the end of the post was too small to glue the bud onto. You can just use a plain post earrings if that is your preference. Step 3: Repeat ~ and voilà! You have two cute ric rac rose earrings to wear. Step 1: Cut a 82cm piece of 1cm wide ric rac and roll into a rose. Glue the end down. Step 2: Peel the outer layers of the ric rac back to ‘unfurl’ the bud. You may have to glue the bottom of the rose to keep it from falling apart. Step 3: Cut out some green felt in the shape of leaves and a small circle that is the width of your broach pin. Step 4: Glue down the leaves, then the broach pin, then the felt circle. You want the circle to sit in the middle of the back of the rose and cover all the untidy glue. Now you are ready to début your lovely set of ric rac rose jewelry. (✿◠‿◠) You could also make a ring, or glue a rose to a clip and wear it in you hair ~ really the possibilities are limitless. Ric-rac can add the perfect sweet touch to just about anything; so have fun with it! This is such a cool tutorial! Ill have to try it sometime! I think it'd also make an interesting ring and I have some plain rings to craft with! That looks really effective! Very pretty for something that looks so simple to do. And I love that it makes such tiny roses, it opens up a lot of possibilities for how to use them. Thanks for the tutorial! You're so welcome Tanith. I love the little ric-rac roses too! I think that they would be a very sweet embellishment around a neckline of a dress as well. What a terrifically pretty, creative project. These pieces have a distinct vintage air to them, even though I know (in picture clear form!) that they're brand new and that makes me want to try my hand at making them all the more. Something to do one the on day a year all the forces that have to fall into place allow me to get some crafting done (I jest...sort of...I went about 15 months last dry spell before my health let me have a day of crafting again - hopefully it won't be as long this time). Not to turn into an intentional Debbie Downer though - sorry! No, I completely understand. I too have been itching to craft but health and timing has not really allowed me to sit down and do very much. I've been trying to content myself with my knitting. the first dress is totally adorabel. the colour and the ric-rac details of course!!! This is adorable! I'll have to try it!